¿Es Posible Que Gane Otro Partido? Dada la actual atmósfera de insatisfacción generalizada con los tres partidos políticos tradicionales, es posible que otro partido gane la contienda electoral. Si es cierto que los individuos no están dispuestos a modificar las costumbres habituales por mucho años, también es cierto que solo se requiere insatisfacción con el estado presente de las cosas y el convencimiento de que hace falta un cambio. El pueblo de Puerto Rico ya llegó a ésta intercesión. Ahora, sólo con una buena alternativa, con propuestas afines a nuestras necesidades, podemos motivarnos y estar dispuestos a cambiar las costumbres eligiendo a otro partido. 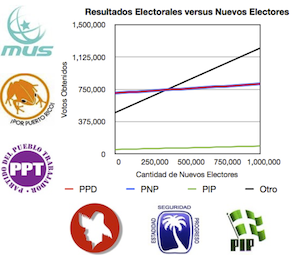 En éste artículo exploramos el trasfondo de la situación actual que arropa a Puerto Rico y hacemos un análisis numérico de las diferentes posibilidades para que gane otro partido. Examinamos el impacto de cada grupo electoral, los electores afiliados, los electores no afiliados y los electores inactivos, en los resultados de la contienda electoral venidera. Finalmente, proponemos metas alcanzables de incursión en cada grupo electoral, que pudieran formar parte del marco estratégico para las aspiraciones de cualquier partido político nuevo. The Merriam-Webster Dictionary defines bilingualism as the ability to speak two languages. Now, that is a really specific definition. For that matter, how well do you need to speak both languages? How many words you need to have in your vocabulary? How often do you need to speak each language? If you can read both, are you bilingual? What about if you understand the spoken words but don’t speak it? What if you can write both? Where is the fine line when you stop being a monolingual and start being a bilingual? I believe that your are bilingual, to a degree, when you can function and can fulfill your needs requiring the two languages. I don’t think there is a fine line that you cross and become bilingual. I propose there is a zone in which you start to be bilingual to a degree. Once you progress further enough inside the zone, the you become fully bilingual. 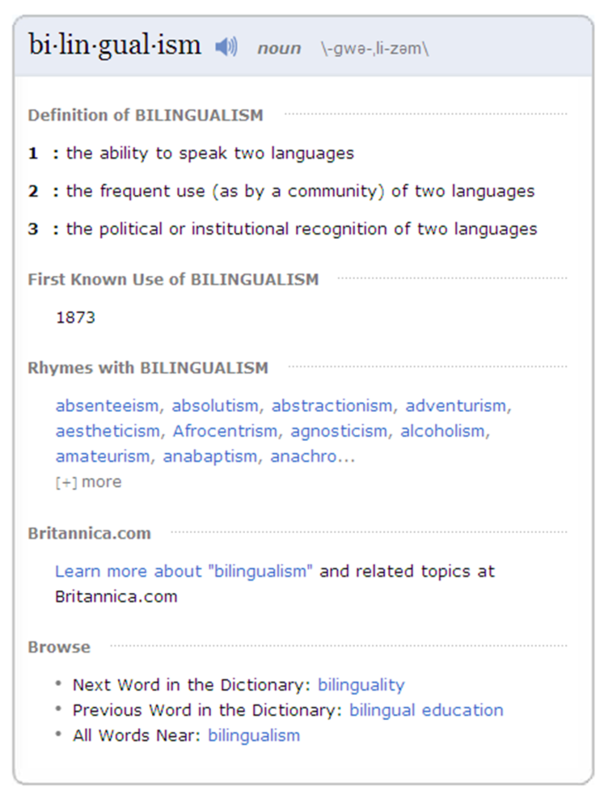 The definition presented is then really defining full bilingualism. George looked at his watch. He raised his sight and looked out through the window. Was it too late to drive home? After all it was raining and one of the wiper of the car was missing. He looked at his watch again and he made a decision. There was really no choice. The exam was next morning and it was only the most important test ever that would validate all his college years. It was going to be dark soon so he hurried up, packed all his stuff for the weekend and rechecked everything he needed. He saw the calculator on top of his bedside table, right next to the broken sunglasses. What was he thinking? He couldn’t forget the most important tool for the test. He picked up the calculator, the car keys and his bag. He opened the door. It was raining hard now. His car was not far away from the door. He ran under the rain and nervously took more time to open the door than he normally would. It was not going to be easy. He looked at his watch for the third time. It was 6:00 PM. He thought he should be home by 9 o’clock.